To commemorate the centennial of the First World War, the Ruskin School of Drawing and Fine Art has commissioned the young British photographer Chloe Dewe Mathews to produce a new body of work, the outcomes of which will be the subject of a major exhibition and accompanying publication. In this video podcast Chloe discusses how her photographic collection is addressing one of the conflict’s most sensitive topics – the execution of troops for cowardice or desertion. Watch and download the podcast at: http://podcasts.ox.ac.uk/shot-dawn-videoo. 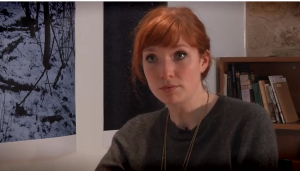 Chloe Dewe Mathews is a contemporary photographer and artist in residence at St John's College, University of Oxford. DIscover her work at http://www.chloedewemathews.com. This entry was posted in Body and Mind, The Memory of War. Bookmark the permalink.